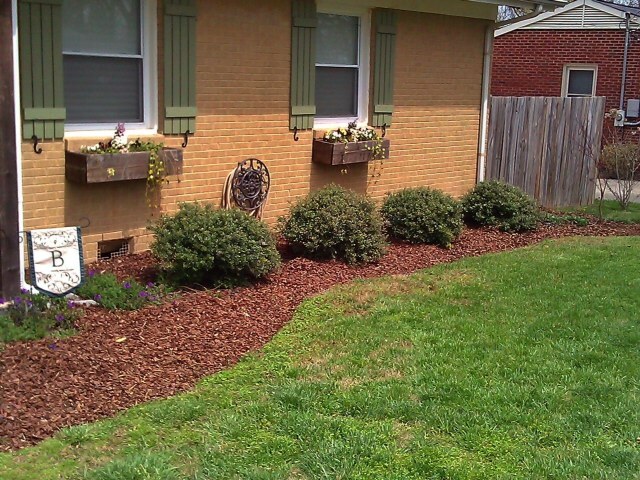 Even though it was cool and rainy this weekend, we did a lot spring cleaning inside and yard work outside, to get ready for the warm weather. Surely it is on its way!! The sun tried to make an appearance but it was short lived. To end the weekend on a good foot and to continue my theme of “Bringing on Spring”, Sunday we made BBQ in the slow cooker. 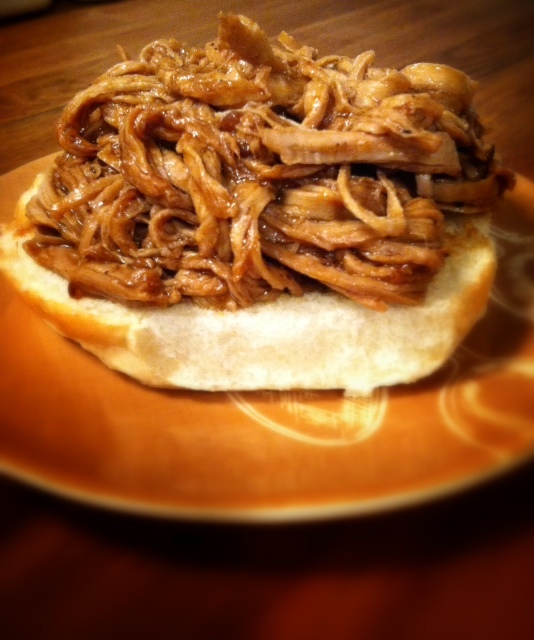 To me, nothing says warm weather like a BBQ sandwich. A lot of people make their BBQ with different cuts of meat but I like using the tenderloin because it is so lean. Start off by lightly spraying your crock pot. 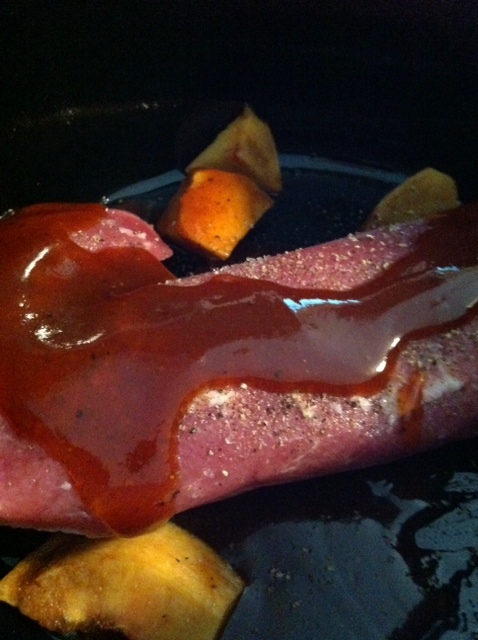 Add tenderloin, sauce and a peach. Yes a peach! You can add whatever spices you like. Salt, pepper, paprika, cayenne etc. Some people may love their BBQ sauce enough and not feel like they need the spices. Salt and pepper are a must. You know it’s ready when you can easily break the tenderloin apart like this. At this point you shred and add more BBQ sauce. Pile high on top of a bun. I wrap my buns (hehe-yes I am 7) in a damp cloth or paper towel and then in aluminum foil. Five minutes inside a 350 degree oven and they’re steamed to perfection. 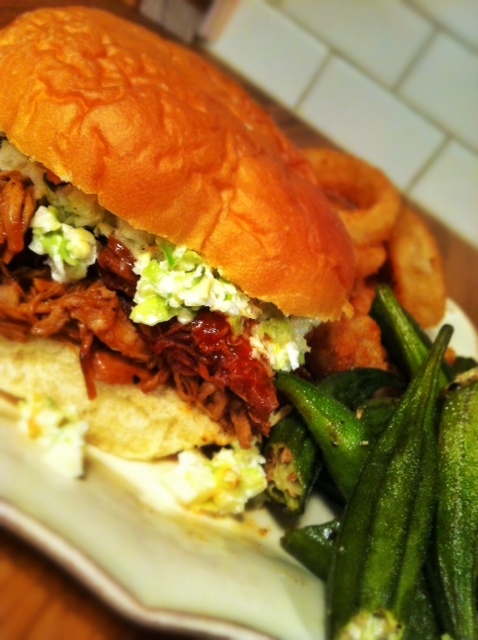 A side of Alexia onion rings and some roasted okra and you’re done! 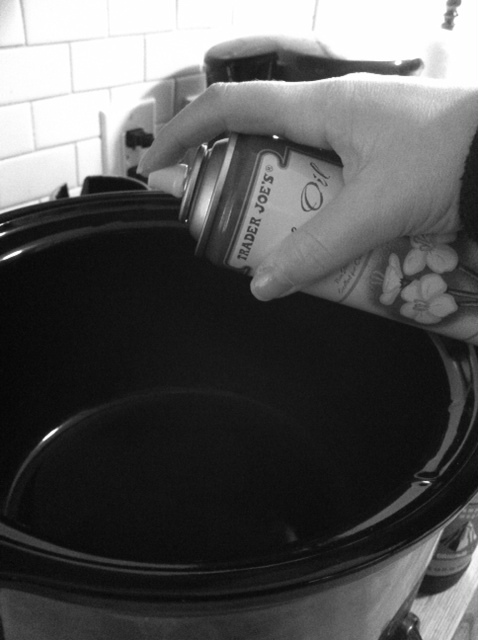 Lightly spray inside of the slow cooker insert with cooking spray. 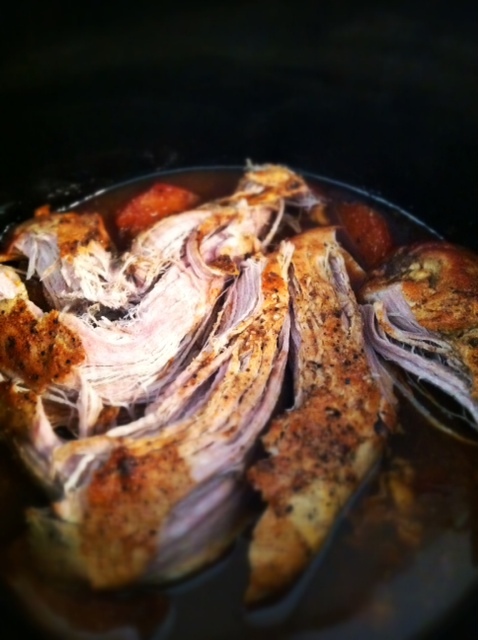 Pour 1/2 cup of the BBQ sauce on the bottom of the slow cooker. Lay tenderloin on top of the BBQ sauce. Sprinkle with salt and pepper. Throw in the cut up peach. Top with 1/2 cup of sauce. Cook on low for 4-5 hours. When tenderloin breaks up easily, begin to shred. Add 1/2 cup of BBQ sauce and cook 1 hour more. Finish shredding, add final 1/2 cup of BBQ sauce and stir to combine. 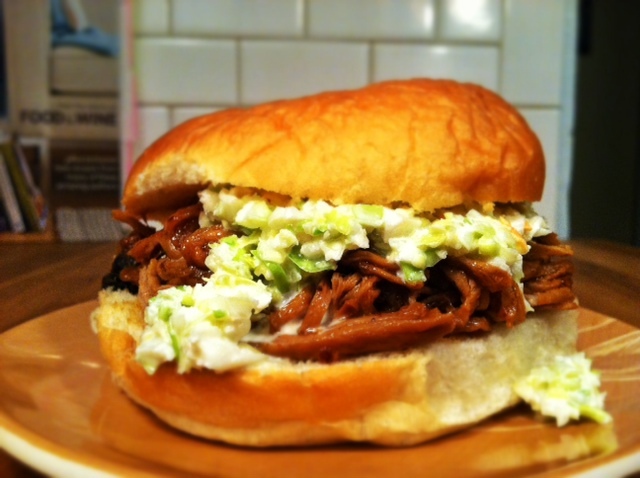 Serve on warm buns with slaw or your choice of toppings. OK…need the roasted Okra recipe!! Going to try the bun method too!! Love your recipes! Thanks! I am so glad you like them. Check out this link for the okra instructions and directions. I think they are just as good roasted as they are fried!